Question: If you were a comic book publisher, who would you try to sell your comics to? What type of audience would your marketing (in whatever form it took) speak to? The obvious answer, of course, is some subset of comic book fans. "It's kind of like The Goon only with a more contemporary flavor." "I'm aiming this towards superhero fans who want to see Latino's better represented in comics." "It's a manga version of Bone." "Think of it as a cross between Witchblade and Power Girl." The issue, though, is that that's not exactly who you, as a publisher, need to be aiming for. Yes, you definitely want to create interest around the book with the audience most likely to respond; that's how you get people to be more than just fans, but vocal advocates of your book. But there's a LOT out there clamoring for people's attention. Based on volume alone, Marvel and DC eat up a lot of comic fans' attention, even if they're actively trying to ignore it. Which means that setting up an RSS feed from your site and sending press releases to Newsarama is not enough. That will certainly buy some traction and it's a necessity of doing business in the comic industry these days, but you likely won't get much new interest from those, again, thanks to the sheer enormity of everything else. The key to grab people's attention is to utilize the attentions they're already honed in to listen to. If you can target a handful of folks who can sell the book for you, you have a better chance of making it. I spoke to this, in a more general sense, a few months back. However, I neglected to mention a specific key influencer that is worthy of attention: the comic shop retailer. They're noteworthy for a couple of reasons. First, they are generally seen as subject matter experts when it comes to comic books. Since they, by the very nature of their job, deal with comic books all day, every day, they HAVE to know what's going on just to keep their business running. 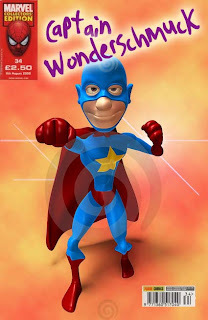 If they tell every customer that they think Captain Wonderschmuck is a great book, they're almost certainly going to sell more of them than if they never mentioned it unless somebody asked. Seems fairly obvious, right? The second reason that they're significant is that they're the ones who are actually on the front lines. They're the people your readers are going to interact with about the purchase. Which means that they are a publisher's sales force. If a publisher treats retailers well, the retailers are going to be more open to that publisher's books. Let's say you've created Captain Wonderschmuck and it's a pretty good comic. You're no Will Eisner, but it's a decent book. You've got your web site set up and you've got accounts set up on Facebook and Twitter and everything. You've sent out press releases to all the comic news outlets. You even got a couple of decent reviews from Tom Spurgeon and Blair Butler. All of which is done in advance of the book actually hitting the stands. Now, you've got Joe Reader who goes into his Local Comic Shop. He sees the book on the shelf of new comics, picks it up and flips through it. He hems and haws and finally turns to the retailer and says, "I don't know; I've heard some good things about this, but..."
If the retailer is like many of them, they might say, "Yeah, I've heard some good things too." Which may or may not sway the potential reader. It's an understandably non-committal statement from the retailer -- they don't want to lose creditibility by saying it's good if they haven't read it. And if the book just came in, they likely haven't had a chance. (One retailer I knew admitted to being two years behind on Captain America and was trying to race through them to catch up in time for when Marvel was going to kill the character off.) So the potential sale in this instance is reliant on any number of factors now outside the publisher's control. How much cash does the customer have right then? Did they have a decent lunch? How much crap is their boss giving them at work? None of these things will overtly tell the customer to buy the comic or not, but it will influence his mood. If he's sitting on the fence about it, though, a bad tuna melt might be enough to get him to put it back on the shelf unsold. "I don't know; I've heard some good things about this, but..."
"Same here! I haven't read that particular issue yet, but they've been putting out some great stuff in general lately." The question then becomes, how does a publisher court a retailer? More to the point, how does a publisher court ALL retailers? One could print up advance copies of comics and posters and flyers and some small tchotchkes, and send a care package to every retailer individually. Which is doable, but pricey. And it would likely be a waste on some retailers, who might not have wall space to hang a poster in the first place, even if they do like the art. Ah, but this is the 21st century, my friends, and we have 21st century technology at our disposal! What about this...? How about a portal web site where retailers could log in, and get all sorts of free material to use? PDF copies of every new issue a week before they come out, downloadable flyers or tent-cards to print off and hang around the store, posters available for order through some POD system. Some kind of downloadable papercrafts that could be folded up easily and made into a cool counter display? Maybe even some POD key chains or pens or Post-It pads or whatever do-dads make sense for that publisher or comic title? "Wait, Sean," you're saying, "no publisher is going to release ALL of their comics online before they might sell them in the store. They'll end up as torrents in no time!" If you had them downloadable in the same way as they're available for print, sure. But you could watermark the ones in the retailer portal. You could even watermark them on the fly, so that each page is stamped with the retailer's name and address; that way, even if they did upload it for torrents, it would be immediately obvious who was doing it, and their access rights could be revoked. "Sean, this is sounding pretty complex. I don't think even guys like Marvel and DC have the technical know-how to do something like this." As I said, this is the 21st century. This kind of software is available for off-the-shelf purchase from any number of places. I'd bet any IT guy worth his salt even has three or four products in his mind that could be installed within a week. The only issues then would be setting it up for the 3,000 or so retailers (no small task, to be sure, but one that doesn't require specialized skills) and then populating it with content (again, no small task, and would be dependent on the material that publisher produced). Not every retailer would actually use such a portal, certainly, but think of the goodwill and PR that would generate within the industry. Your more savvy retailers would almost certainly jump all over that and, being savvy retailers, probably have more influence than most other comic influencers. I certainly haven't tried doing anything resembling number crunching here, but I can see that kind of set-up paying for itself fairly quickly. Any publishers out there reading this?